In Paris, a new book project is the perfect excuse for old friends to reunite. Here’s how host Ajiri Aki planned the fete. When I ﬁrst met photographer Jessica Antola almost a decade ago, our paths had surprisingly never crossed despite having so many people and interests in common. We immediately hit it off and talked for hours about both having just moved to New York from Paris (I returned seven years ago and settled with my family), her frequent travels throughout Africa, and my early upbringing in Nigeria. We’ve since maintained a transatlantic friendship, meeting up often and always encouraging each other on our various projects. For me, it was recently launching Madame de la Maison, a linen and antiques rental and sales business, and for Jessica, it was her ﬁrst monograph, Circadian Landscape, a collection of photographs she took between 2011 and 2014 during trips through sub-Saharan Africa. To celebrate the new release—and to thank Jessica for the role she played in leading me to ﬁnd my true passion—I hosted a lunch at home, bringing together mutual friends from Paris and New York (who happened to be in town), including fashion veterans Jen Mankins of Bird and Michelle Stein, designers Victor Glemaud and George Sotelo, writers Lindsey Tramuta and Emilie Meinadier, and Benjamin Lanz of The National and Beirut and his wife, musician Sonya Hofer. The different places where our worlds collide—and Jessica’s artist statement in the book on how people express themselves in relation to their environments—guided the look and feel of the party. I love a theme because it’s a thread that helps pull things together creatively. The starting point for the decor was two of my favorite images from Circadian Landscape, Toﬁnu Girls, Benin 2014 and Washing Day, Senegal 2011, which I matched to a wax fabric found at a local ﬂea market and made into a runner. Antique Limoges gold-rimmed plates seemed appropriate (Africans love their gold jewelry), paired with Madame de la Maison’s Thyme tablecloth and Lavande napkins. For a personalized touch, I asked my friend illustrator Jessie Kanelos Weiner to create ombré menus and print postcards that added an extra touch to the table and served as a memento for each guest. A thoughtful tablescape set the mood for the event. Since becoming a more experienced entertainer, I’ve learned that you do not have to cook to host people! I can’t make a big Nigerian meal to save my life, so I ordered shrimp fried rice, jollof (a one-pot rice dish), and chicken suya from African Kitchen in the 11th arrondissement. At home, I threw okra, tomatoes, and Scotch bonnets into a skillet with a little ras el hanout (a North African spice mix), then added plantains sliced Hasselback-style with some garlic olive oil, and baked it in the oven for 25 minutes to offer as a side dish. To me, graze boards are the new cheese and charcuterie plates. The idea is to slightly overﬁll a platter with ingredients while keeping color and pattern in mind. You’ll have a pretty spread with minimal effort required. For cocktails, a spiked punch is something you can premake and guests serve themselves. My version has hibiscus tea and ginger juice, with Prosecco, a little vodka, and mint to garnish; or lemon juice, gin, and ginger beer topped with rosemary as a second option. 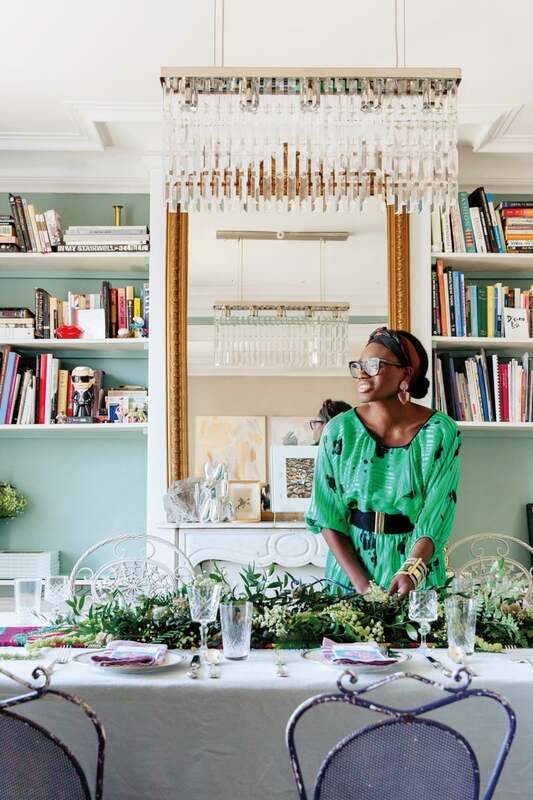 I wanted the ﬂorals to be reminiscent of the dry climate and bizarre plants at my grandmother’s house in Nigeria, as well as the sculptural-looking greenery in Jessica’s photographs. Dried ﬂower expert Alix Mobuchon of Racine, who works with such fashion brands as Chanel and Isabel Marant, created two large arrangements that ﬁt the theme. On the table, I like to keep ﬂorals cheap and cheerful but impactful—arranging baby’s breath or wax ﬂowers in small vintage vessels, for example, or using fragrant eucalyptus or ruscus to make a runner. I loathe giant blooms that block the person across from you. Bigger statement bouquets can be put on the mantel or off to the side—no ducking and diving to speak to your guests! Find one little gem that is the reason or inspiration for gathering people—a book, work of art, city—to spark your creativity and play with a theme. Rent what you need, especially if you’re hosting a larger group. Add in a few antique pieces to make your table look extra-special. Don’t be afraid to cater or stick to menu items that can be prepared the night before or easily assembled the morning of the get-together. Use linens and don’t entertain with paper or plastic. You’ll have one less thing to run out and buy, plus it’s much more eco- (and wallet-) friendly. Set the table the night before. You’ll sleep much better knowing one step is done, and it’s nice to wake up to. If you can swing it, hire someone to help you clean up after the party.